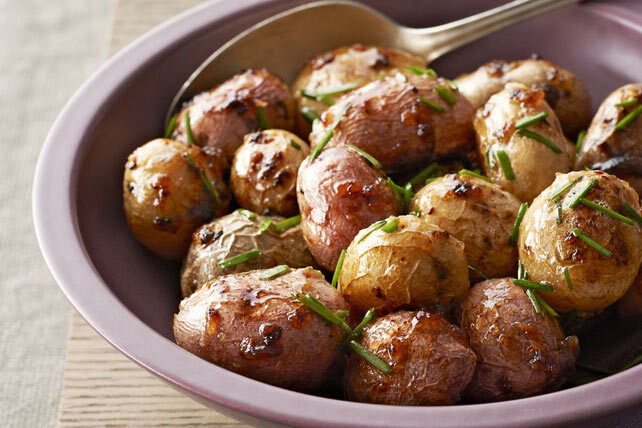 Looking for a deliciously simple potato recipe? Look no further! Our Potato Gems recipe will have your guests asking for more. Spread potatoes onto rimmed baking sheet; spray lightly with cooking spray. Bake 20 to 25 min. or until tender; place in large bowl. Add dressing; toss to evenly coat. Return to baking sheet. Bake 5 to 8 min. or until lightly browned. Transfer to serving dish; sprinkle with chives. New potatoes are available in a variety of colours, such as red, yellow, white and purple. Look for them at your grocery store or local farmers' market. Insert a knife into the centre of the potato to see if it is done. If the knife meets no resistance, then it's done.